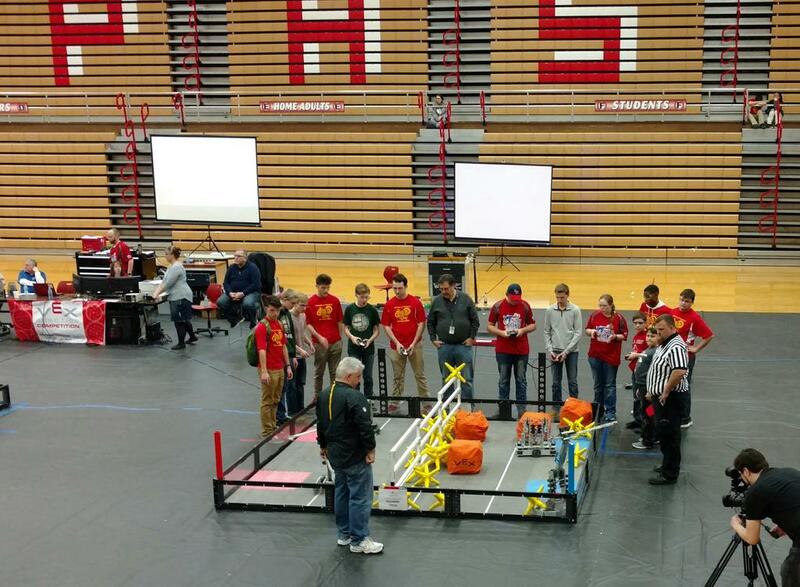 Last month Plymouth High School hosted the Vex Robotics challenge. This is the second year that they’ve hosted the challenge. Becky and I attended again this year and again were blown away by the kids. Watching what the kids have built is impressive to start with, but add to that the strategy and teamwork involved and the the challenge shows up with lots of dimensions. Each year the challenge is different, but some of the premise is the same. In a nutshell, there are head to head challenges using the robots, first a pre-programmed challenge followed by a battle using remote controls. The teams then have to form alliances to battle in the final competitions. I take a personal interest in this program as I feel I played a part in it’s inception. As a member of the Marshall County Community Foundation (MCCF) Grants Committee, I was assigned the review of the grant application for the funds that helped get the program off the ground. I was so blown away by the two high school kids that were the impetus behind the program that I couldn’t help, but advocate for them before the committee. The video below shows one of the robots and its creators that impressed me so much. They blew away the competition. If you get the chance to go, I recommend it. These are some of the kids that will be in charge of our future.